In this email, Foray Chair Sam Landes reveals more exciting news about NAMA’s upcoming foray in the Pacific Northwest, October 11-14. BC: Let’s talk mushrooms first. What kinds of “only in the Northwest” mushrooms should we be able to find in mid-October? SL: It’s the beginning of matsutake season and the Oregon truffles may be starting too. Since our foray sites will range from the Cascade Mountains to the Oregon coast, we’ll be able to find quite a variety of fungi. BC: Mushrooms are only part of the fun of the foray. What else will we especially like about this spot? SL: The MacCleay center is a great facility. It’s a conference center as opposed to a camp, so it’s designed for adults. The space is compact and level and the rooms have air conditioning and heat. There’s an outdoor pool, a hot tub, and his and her saunas. There’s a coffee bar and we can bring beer and wine. The food is good, and there will be vegan, vegetarian, and gluten-free options. There are small designated smoking areas for any legal substance and plenty of places to socialize. For those who prefer to stay in a hotel, we’ve arranged special rates at the Best Western Pacific Highway Inn in Salem. It is about 15 minutes from the Macleay Center. Call to request the NAMA rate. BC: I know that you’ve scheduled some of our favorite traditional events such as a mushroom feast (mycophagy) and lots of lectures. Are there any “for the first time” or “only in Oregon” events people will want to know about? SL: We have several speakers from Oregon State University. One of Friday evening’s keynote speakers, professor Sara Robinson, will be speaking about spalted wood—beautifully colored and patterned wood that results from fungal decay. Check out Spalted Wood (the movie) here: http://spaltedwood.com/. On Saturday, she’ll give a wood turning demonstration and also have pigment samples for you to paint with. There will be sessions on identification, photography, and cultivation. As always, there will be a mushroom tasting, and members of local clubs will offer cooking demonstrations. 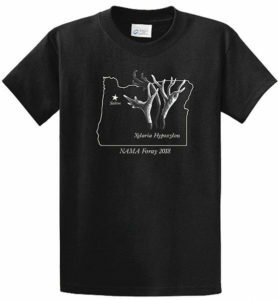 If that isn’t enough fun and fungi, put on this great foray t-shirt and head 50 miles down the road to the Breitenbush Hot Springs Mushroom Gathering, October 18-21. The full event schedule will be posted on NAMA’s website soon.